With 2 servings per pouch, Bonk Breaker Energy Chews give you a blast of energy. Caffeine from white tea recharges your fuel tank with clean, easy digestible and great-tasting non-GMO fuel. 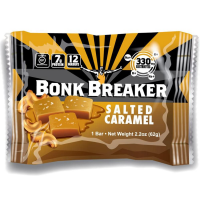 Beat the dreaded bonk or recover post-workout with the Bonk Breaker Premium Protein Bar. Its proprietary blend of collagen and grass-fed whey protein offers handy fuel for any adventure.